We are hopping with ImpressArt! The DCC Blog Connection designs with ImpressArt Metal Stamps. They are running a contest with a great giveaway from now until midnight May 21st. Details to enter on Monday! Be inspired over the weekend by the talented designers and their use of ImpressArt Metal Stamps. 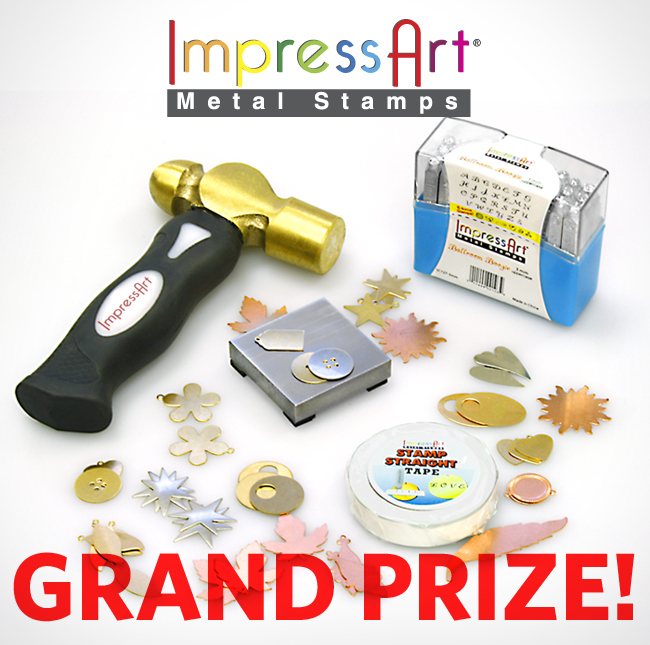 I have never designed with ImpressArt Metal Stamps but found the tutorial on their website very easy to follow and it shows how exactly to use the stamps. I was inspired by the oval discs which reminded me of eggs, thoughts of spring, my love of birds and my piece came together Bird Song. A new felt collection had also just arrived from National Nonwovens called Daydream Inspirations. The Havanna Gold was the perfect compliment for ImpressArt's discs. Following the directions stamp the word "create" on the larger oval, "dream, fly, soar" on the smaller ovals. Choose words which speak to you. My stamping is not in a straight line, I wanted a freer expression but I still used the guide for spacing my letters evenly. Here the discs are stamped and the letters antiqued with a Sharpie. To create the pillow you will need. Stamp cotton with chosen bird design. Heat set. Stitch cotton to wool felt. Stitch pillow together, stuff and close opening. Bend one wire end andi insert through small hole in top of pillow, repeat for opposite side. Tie loops of jute through discs. Tie burlap piece in center. Fray jute pieces and tie into bow. Glue burlap bow, jute bow to upper corner. Glue jute ends of discs to bow. Glue flower to center. Insert bird diecut and glue. Tie small dream disc to large create disc with jute. Glue to center bottom of pillow. Use stamp pad to antique flower and pillow front. The Grand Prize! Enjoy the hop! Happy weekend and Mother's Day to all the great moms! What a wonderful project. Perfect for any time of year. Uh oh! I see a need for more art materials. Love this design Debra! Love this Debra!!!! The charms look great with the rustic fabrics you chose. Debra, this wall hanging is just beautiful! Another lovely project my friend! Great job! Debra...thank you so much for joining us in this hop. I love that you stepped outside of your comfort zone and incorporated metal into your project. It just took it to a whole other level. Beautiful! Thank you everyone for your wonderful supportive comments! I have enjoyed the out of my comfort zone Theresa! Thank you Lisa, Molly, Anne, Theresa, Cindy, Jennifer been great fun! As always Debra - just so sweet and lovely! I just mentioned in another comment how I like how the metal pieces make a nice addition to a project. Kerry, I love what you do, you are so so talented!